SPEA—the School of Public and Environmental Affairs at Indiana University in Bloomington— is the first school to combine public policy, management, and administration with environmental studies. Founded in 1972, SPEA has focused on applied problem solving for more than 40 years, tackling issues of importance to cities worldwide. 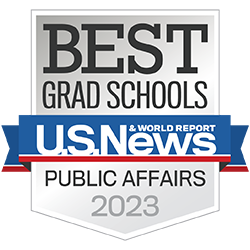 2016 nationwide graduate school rankings, out of 272 schools. Our more than 100 full-time and 90 part-time faculty members bring unparalleled expertise to their fields. Many of our faculty members have a long history of membership and service to ARNOVA, including past president, Kirsten Grønbjerg, and current board member, Beth Gazley. Our Ph.D. candidates deliver impactful research and thoughtful policy consideration, each dedicated to leading for the greater good whether it be in continuing research or educating the next generation.